After breakfast today, we set out on our day tour of Old and New Delhi. The difference? The former is literally the old city, while the latter is the hundred year old legacy of British Colonial India. The contrasts are stark. Our guide today was Vivek, who was OK, but not great. He had a tendency to give quick talks, and then stand in the shade while giving us ample opportunity to “explore” on our own in the crazy 100 plus-degree heat. We visited several sites, most notably Gandhi’s memorial (quietly elegant and understated) and Humayun’s Tomb (see pictures). This is the tomb of the great grandfather of the king who built the Taj Mahal; it’s easy to see the similarities in architecture. What’s really remarkable though is the way he died. 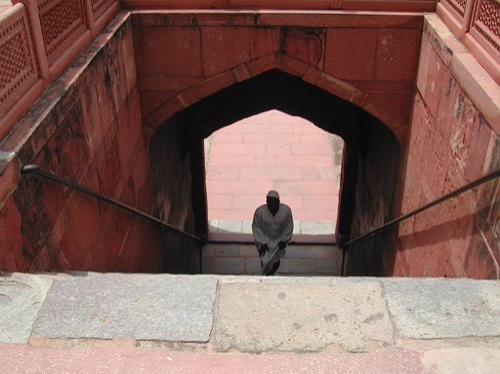 Apparently, he was high on opium, sitting in his library at the top of the steps (very much like the ones recreated for his tomb in the picture) when he heard the call to prayer. You guessed it. He runs out to pray, trips on his robe, takes a bad fall and dies. The monument was built by his wife, complete with the stairs to commemorate his (honorable?) demise. On another note, I pointed out to Vivek the absence of cows on Delhi’s streets. I mean we only saw three oxen total, and this was on a rickshaw ride through the back alleys of Old Delhi. Apparently the cows were removed from the streets of Delhi when India hosted The Commonwealth Games 13 years ago, put out to peaceful pasture, and haven’t been returned. This IMHO is probably why Delhi is not as smelly as I feared it would be. So far, no sign of any monkeys either. Any of this can change tomorrow when we head to Agra to see the Taj Mahal. Old Delhi’s infamous electrical wiring. One of maybe three oxen we saw in Delhi. A colorful storefront in Old Delhi. Mahatma Gandhi’s memorial, an eternal flame. India Gate in New Delhi, built by the English to commemorate WWI. A tuk-tuk laden with passengers.